Ghanaian actress and comedienne, Afia Schwarzenegger will no longer bear her legal name, according to court document. The host of “Atigya” show whose real name is Valentina Nana Agyeiwaa is now going to be addressed in all documents with her showbiz name instead. She is now officially and legally known as ‘Queen Afia Schwarzenegger’ and wouldn’t respond to her former name. Afia made this revelation through her Instagram page on Monday, April 8. 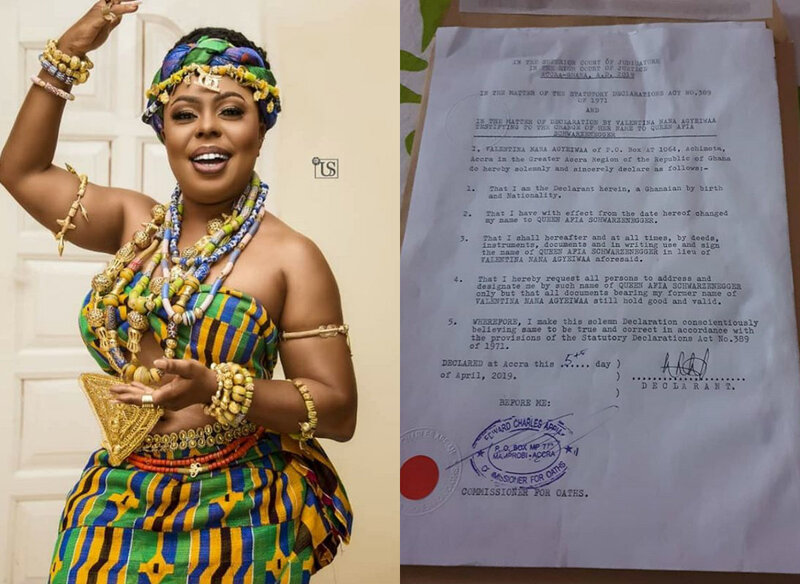 She shared an affidavit to that effect on her page with the caption: “Dear Schwaralewas, With the consent of my parents and my fiancé, I am Officially Queen Afia Schwarzenegger …All documents bearing my old name Valentina Nana Agyeiwaa is still valid..
Dear Schwaralewas, With the consent of my parents and my fiance I am Officially Queen Afia Schwarzenegger …All documents bearing my old name Valentina Nana Agyeiwaa is still valid.. From this day you can only address me with the name…QUEEN AFIA SCHWARZENEGGER To God be all the glory.. #queenofcomedygh👑 #onyamehighlyinvolved #onyamekala #gossipdiva #Godfidence #Leave2Live #TheBreakfastShow #Atigya #Schwartv #KingofQueens Naming Ceremony 85% loading..